Deeply-discounted bundles have turned the difficult process of selling Mac shareware into a viral, timed event with plenty of pomp and circumstance. It's kind of like injecting the abilities of Billy Mays and Vince Offer into a package that's easier on the eyes and ears. Two bundles have just crept up on the horizon, both of which offer an impressive variety of applications at a price calculated for an impulse buy. First, there’s TheMacSale 2, brought to you by MacZOT, a vendor who is no stranger to these kinds of deals. Up for grabs in this bundle is CrossOver Games, Picturesque, HoudahGeo, MacJournal, Morph Age Regular, Opacity Express, Searchlight, Vinoteka, Stone iMaginator and Stor. But why buy all this software for a song when you can get a song with it? Yes, you also get “The Mac Sale - The Song!” with these ten applications, all for $50. 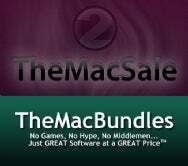 Then there's TheMacBundles, which is brought to you by Steve Becker of MacEase software. In this package, you can get iPhoto Library Manager, MYStuff, MyTunesRSS, PDFClerk Pro, Simon, Spyder, WebPrint Plus, Yum and Yummy FTP. Order in the next 21 days and they’ll throw in A-Dock X and FolderGlance at no extra cost. If you order in the next seven days, you’ll get BlogAssist, too. That’s 12 apps in all for $50. Whoa there, Mr. Pitchman. You may be asking yourself, “what’s with all of these bundles?” That’s a very good question. Bundles have become a great opportunity for lesser-known Mac applications to get exposure. How many of the above apps did you know about before you read this? Personally, I can only name five; I’ve tried three of them. Given how prevalent these bundles have become, however, I’m worried that the community isn’t finding new software through other channels. Case in point, I’ve seen many folks abuzz on Twitter over a bundle that’s being given away for free, but I don’t see those people looking for more Mac software on MacUpdate and VersionTracker. Instead, many of them are waiting for another bundle before they invest in more Mac shareware. Nonetheless, in giving out cheap licenses to use their software, there’s often a little more incentive for users to try out the software than there would be in the usual timed-trial mode that much of Mac shareware uses. Ideally, this translates into better word of mouth and free publicity for many months and years to come.